The FingerTec Data Processor (FTDP) is designed to connect FingerTec terminals to a third party system. The FTDP stores data in a centralized database to multiple LAN users to utilize the database to create an independent system via the ODBC manager. Apart from the ODBC manager, users can export data into different file types as required for input into their third party system. 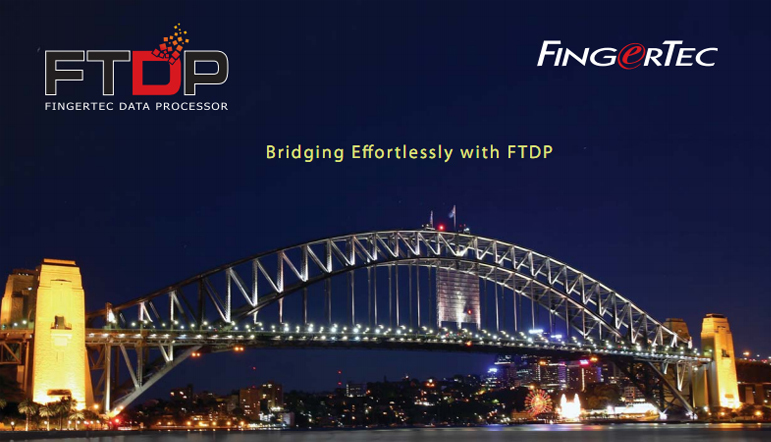 The FTDP is suitable for FingerTec users who are looking for basic data transmission with terminals, without having to perform any configuration in the time attendance settings and report printing, or in short without the need of using the SDK for any integration to a third party system. The FDTP is a free application that is available to all FingerTec users who do not wish to use the TCMS V2 bundled software, but integrate the transaction logs into their own software. For home users of FingerTec H2i and also FingerTec Keylock 8800, FTDP is a simpler yet effective option, providing ease of use to home users who won’t need advanced system configuration. The FTDP can centralize data from all models of FingerTec terminals via IP address, COM port or a URL. User information, RFID cards, fingerprint and face templates can be uploaded and downloaded easily using the FTDP, and can be exported into various formats e.g. txt, Excel, XML or HTML. Download transaction logs saved into the database and view them easily by sorting them according to Device ID, User ID, Username or date of transaction logs. Transaction logs can also be exported into txt, Excel, XML or HTML formats. FTDP supports the common time zone function available in most FingerTec terminals. A total of 50 set time zones are available for configuration. With a USB Flashdisk, the FTDP allows you to read and write users information, RFID card, fingerprint, face templates as well as transaction logs generated from FingerTec terminals. Offers easy setup, conﬁguration and advance setting of multiple terminals. Provides a user-friendly, simple and powerful user management interface. Provides feasibility to download, check, search and export the terminal’s raw data. Offers management of user’s terminal access control information like time zone and veriﬁcation type setting. Provides 50 sets of time zone settings for users’ time zone or time zone grouping conﬁguration to be updated to terminals. Provides feasibility for users to instantly check the terminal for their access control information like privilege, password, ﬁngerprint, card number, veriﬁcation type or time zone setting. To retrieve the user data, ﬁngerprint or face template from USB data ﬁle exported from terminals. To generate the USB data ﬁle from the selected user data, ﬁngerprint or face template for upload to the terminals. • Supports MS Windows Windows 2000, Windows XP, Windows Server 2003, Windows Vista (32/64 bits), Windows 7 (32/64 bits), Windows 8 (32/64 bits) and Windows Server 2008 (64 bits). • Supports Microsoft Access Database or Microsoft SQL Server. • Use ODBC Manager to connect to the Microsoft Access Database to retrieve data for third party system. • Free of charge for FingerTec customers.